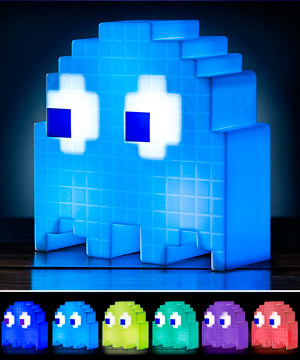 Pac-Man Ghost Light: The famous arcade villain lights up your room. 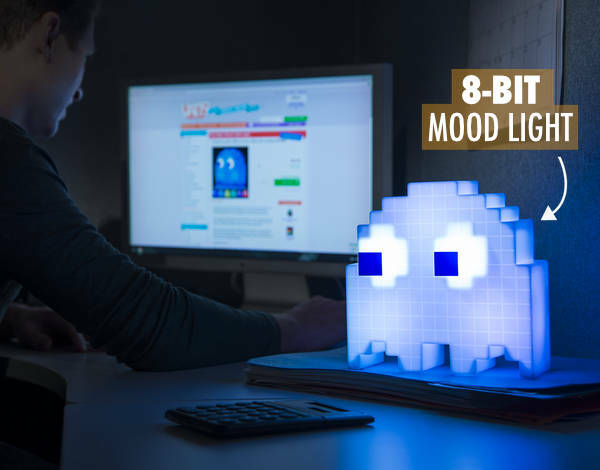 Decorate your room in 8-bit style with the Pac-Man Ghost Light. This desktop mood light emits a soft glow and slowly cycles between several different colors while plugged into any USB power source. The original Pac-Man only had to deal with 4 colors of ghosts but with color-changing LED lights, he has now met his match with 16 hues of ghosts. Good luck getting another cherry, little yellow dude. Want to throw a bash with this little spook? Switch him to party mode and he will change colors to the beat of your music. A small knob on the back of the ghoul allows you to change the musical sensitivity from full-on rager to small get-together. Somehow, a Pac-Man ghost has escaped from a maze into the real world! This fourteen pixel by fourteen pixel ghoul is nearly eight inches tall and adds OG gamer credits wherever it glows. ...and also as yellow as a ghost... and as blue... and as red... and a bunch of other colors, too. 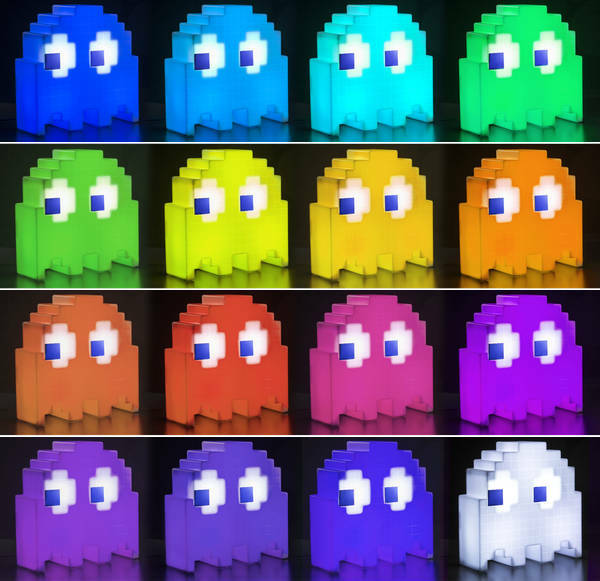 The Pac-Man Ghost Light cycles through sixteen different colors, making it resemble Blinky, Pinky, Inky, Clyde, and almost a dozen more Pac-Man ghosts. This ghost can change the same number of colors as the Pac-Man arcade game can show. With the Pac-Man Ghost Light outside of the arcade, you can drop your quarters into a jukebox instead. With the flip of a switch, the Pac-Man Ghost light will respond to sound and change color on beat. The sensitivity can be controlled with a knob located on the back of the ghost. Question: Does it require batteries? Answer: No, the Pac-Man Ghost Light runs on power supplied via USB. Question: How long is the USB cable? Answer: The included cable is three feet long.